You’ve woken up with back pain at some point in your life. Everyone, at one time or another, is limited by pain in their lower back. Whether you slept awkwardly, sat too long, lifted something improperly, or were just worn out, you know the feeling. Lower back pain, otherwise known as lumbago, has more than its fair share of victims. According to the National Institutes of Health, it’s the most common cause of job-related injury and costs around $50 billion in medical costs. 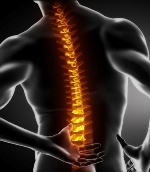 For chronic sufferers, back pain can result in a very difficult life. The simplest tasks are painful and finding the motivation to get out and enjoy life can be nearly impossible. There are, however, some new treatment methods that may revolutionize how lumbago sufferers cope with pain. A new product set to hit the market in 2014 aims to help doctors get a better understanding of the reasons you’re experiencing back pain. It’s a vibrating belt designed to detect signals between the brain and back, showing pain and its contributing factors. The belt provides data to doctors to ultimately help them accurately identify why your back hurts. They’ll use these readings to improve therapy techniques, allowing you to get back to normal as quickly as possible (no pun intended). This product is called “Lumbia” and should be readily and widely available for use in 2014. If your doctor or therapist hasn’t heard of it yet, they most definitely should. There are other treatments in the works, too. A revolutionary treatment for children with Early Onset Scoliosis (EOS) may also pave the way for future improvements for chronic back pain. The new treatment involves magnetic rods being surgically placed along the spine in young children with EOS. It’s revolutionary because the rods can be controlled with a remote control, allowing doctors to make adjustments as the child grows and experiences bodily changes. Typically, children with EOS require regular surgery—sometimes more than once a year—to make adjustments. Now, I don’t want to get ahead of myself—and this is strictly speculation—but there doesn’t seem to be any reason suggesting this procedure wouldn’t work in older people. The surgically implanted rods offer strength and support to weak backs, possibly being used to help seniors with chronic back issues as they age. This is something else to be on the lookout for in the coming year. Currently, the procedure is only being performed on a select few EOS patients, but it is likely to become more common, as resources and technology make it more widely available. When it comes to back pain, it’s never a good idea to wait it out. If you’re experiencing pain in your lower back and can’t determine why, visit your doctor to come up with a treatment plan. The sooner you can get it taken care of, the quicker you’ll get back to living. Rice, S., “Vibrating Belt Helps Those With Back Pain,” Yahoo! Health web site, May 6, 2013; http://health.yahoo.net/articles/back/new-orthopedic-belt-lumbia-assesses-and-treats-low-back-pain, last accessed May 14, 2013. “Surgeons implant magnetic growing rods in groundbreaking treatment for early-onset scoliosis,” ScienceDaily web site, May 8, 2013; http://www.sciencedaily.com/releases/2013/05/130508092404.htm?utm_source=feedburner&utm_medium=email&utm_campaign=Feed%3A+sciencedaily%2Ftop_news%2Ftop_health+%28ScienceDaily%3A+Top+News+–+Top+Health%29, last accessed May 14, 2013.